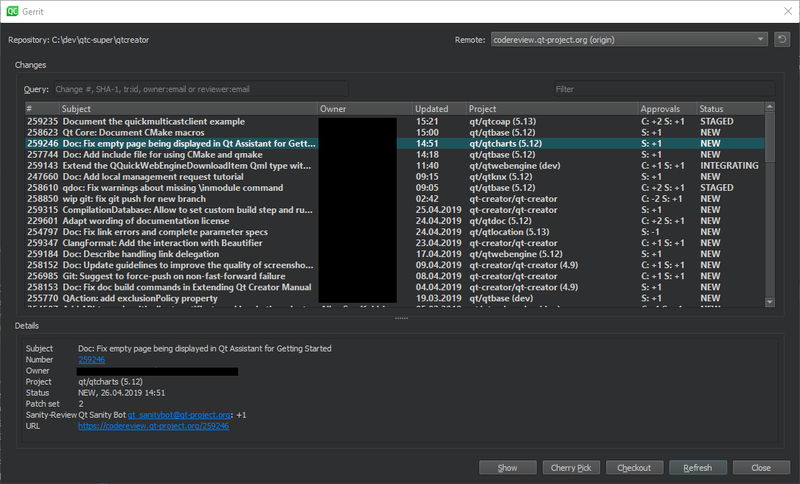 Qt Design Studio uses the version control system's command line clients to access your repositories. To allow access, make sure that the command line clients can be located using the PATH environment variable. Alternatively, specify the path to the command line client executable in the Command field in the version control system specific tab in Tools > Options > Version Control. If authentication is required to access the repository, enter the user credentials in the Username and Password fields. Enter a timeout for version control operations in the Timeout field. For some version control systems, you can specify the maximum number of lines the log can contain in the Log count field. After you set up the version control system, use the command line to check that everything works (for example, use the status command). If no issues arise, you should be ready to use the system also from Qt Design Studio. For more information on using Git for Windows, see Using Git for Windows. Wrap submit messages at limits the line length of a submit message to the specified number of characters. Submit message check script is a script or program that can be used to perform checks on the submit message before submitting. The submit message is passed in as the script's first parameter. If there is an error, the script should output a message on standard error and return a non-zero exit code. After you specify a file in this field, you can select authors as values of the submit message fields in the Nicknames dialog. After you specify a file in this field, you can add authors as values of the submit message fields when submitting changes. If you also specified a User/alias configuration file, you can select authors in the Nicknames dialog. SSH prompt command specifies an ssh-askpass command that you can use (on Linux) to prompt the user for a password when using SSH. For example, ssh-askpass or x11-ssh-askpass, depending on the ssh-askpass implementation that you use. Reset VCS Cache resets the version control system configuration to a state known to Qt Design Studio after it has been changed from the command line, for example. You can set the HOME environment variable from Qt Design Studio. Select Tools > Options > Version Control > Git, and then select the Set "HOME" environment variable check box. HOME is set to %HOMEDRIVE%%HOMEPATH% when the Git executable is run and authorization works as it would with git bash. You can diff the current file or project to compare it with the latest version stored in the repository and to display the differences. To display the diff in a read-only editor, select Diff of. If the file is accessible, you can double-click on a selected diff chunk and Qt Design Studio opens an editor displaying the file, scrolled to the line in question. To submit your changes to Git, select Commit. 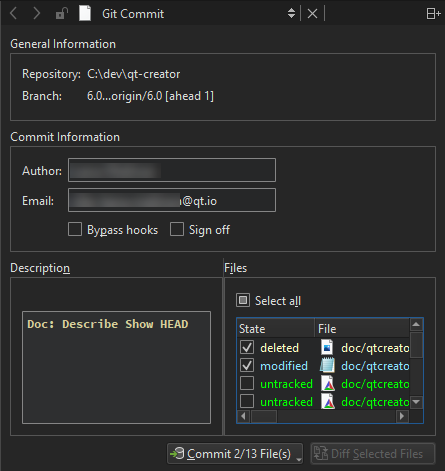 Qt Design Studio displays a commit page containing a text editor where you can enter your commit message and a checkable list of modified files to be included. Patches are rewriting instructions that can be applied to a set of files. 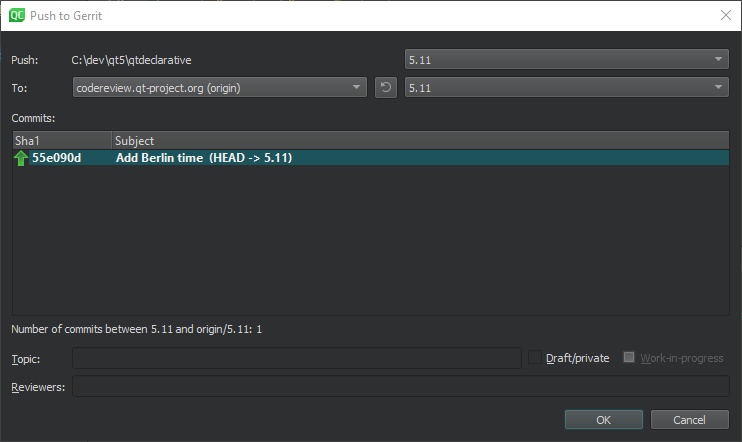 To apply a patch file that is open in Qt Design Studio, select Patch > Apply from Editor. To start controlling a project directory that is currently not under version control, select Tools > Git > Create Repository. 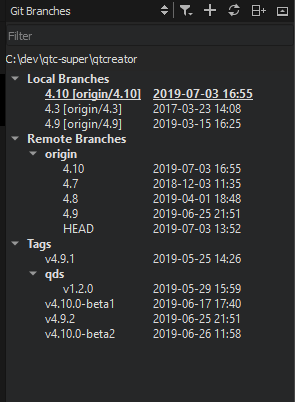 Qt Design Studio creates a new subdirectory named .git that contains all the necessary repository files. However, nothing in the project is tracked yet, so you will need to create an initial commit to start tracking the project files. 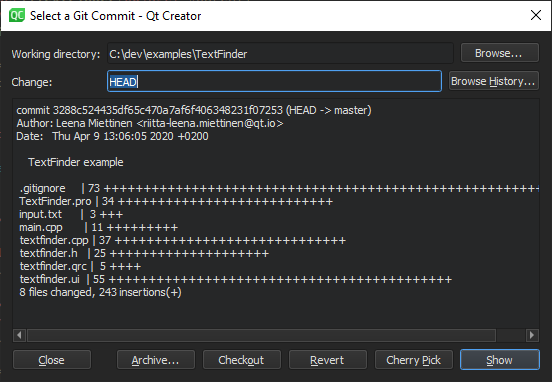 If your Git project uses Gerrit for code reviews, you can view your changes in Qt Design Studio. Note: On macOS, the default Git installation does not contain Git Gui. To use Git Gui, install it separately. To start Git Gui from Qt Design Studio, select Preferences > Version Control > Git, and set the path to the environment that contains Git Gui in the Prepend to PATH field.